The latest national survey by the Pew Research Center for the People & the Press, conducted June 28-July 9, 2012 among 2,973 adults, including 2,373 registered voters, finds that Romney has not seized the advantage as the candidate best able to improve the economy. In fact, he has lost ground on this issue over the past month. The Supreme Court’s recent ruling on the 2010 Affordable Care Act appears to have had little effect on the 2012 race. But the decision has had a substantial impact on views of the court itself. About half of Americans (51%) express a favorable opinion of the court, while 37% have an unfavorable view, up eight points since April and the highest percentage expressing an unfavorable opinion in a trend dating to 1985. The more negative view of the court is largely being driven by Republicans: Three months ago, Republicans viewed the Supreme Court favorably by a 56% to 25% margin. Today, they view the court unfavorably by a 51% to 38% margin. The presidential campaign’s dynamics have changed little in recent months, despite the court’s high-profile health care ruling, a series of subpar job reports and increased campaign activity on the part of both candidates. 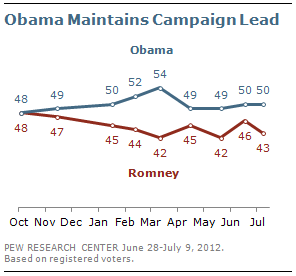 Independent voters remain evenly divided, 46% support Romney while 45% back Obama. Nearly identical majorities of Democrats (88%) and Republicans (89%) support their party’s candidate. Obama’s lead arises from the Democratic Party’s continuing advantage in party identification among registered voters. While Romney has nearly uniform support from his base, he continues to struggle in building enthusiasm. Just 34% of Romney voters support him strongly, compared with 64% of Obama’s backers. Yet this lack of enthusiasm does not mean that Republican voters are disengaged. Seven-in-ten Romney supporters say they have given quite a lot of thought to the election, compared with 62% of Obama supporters. This gap has remained consistent throughout the year. The electorate remains deeply unhappy with the way things are going in the country. Just 28% of registered voters say they are satisfied with national conditions, while two-thirds (67%) are dissatisfied, which is largely unchanged from recent months. The poor job reports have not gone unnoticed by the public: 51% say they are hearing mostly bad news about the job situation, and 40% say the overall economic news is mostly bad. However, these evaluations are no worse than they were a month ago, and are not having a negative effect on impressions of Obama’s performance. At 50%, his current job approval rating is actually up slightly from 47% last month and in positive territory for the first time since March. The job situation remains the number-one issue for voters in this campaign. Neither candidate has a clear advantage on this issue: 46% say Romney and 42% say Obama can do a better job improving the job situation. More generally, Mitt Romney has lost ground over the past month on the issue of the economy. The eight-point advantage he held in June as the candidate better able to improve the economy has now flipped, with 48% saying Obama can better improve economic conditions, while 42% favor Romney. 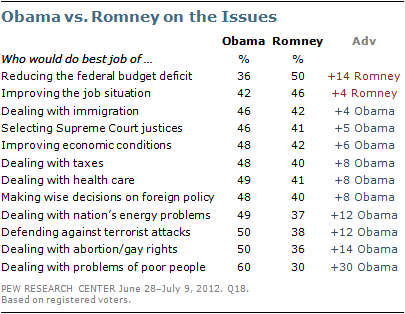 Of 12 issues tested, Romney is seen as stronger than Obama on only one – reducing the federal budget deficit – while Obama has the edge on eight. By two-to-one (60%-30%) Obama is seen as the candidate who would better deal with the problems of poor people. By a 50% to 36% margin, more voters say Obama better reflects their view on social issues like abortion and gay rights. Obama also holds 12-point leads as the candidate better able to defend against terrorist attacks and deal with the nation’s energy problems. Health Care Remains a Secondary Issue. The proportion of voters saying that the issue of health care will matter most in their vote has increased very little in the wake of the court’s decision upholding the 2010 law. Just 22% rate health care as their top issue, largely unchanged from the 19% who said this last month. Independents View Both Parties Unfavorably. For the first time in the past four election cycles, majorities of independent voters view both parties unfavorably: 57% of independents have an unfavorable opinion of the Democratic Party, while 62% view the GOP unfavorably. Public Sees Better News on Gas Prices. While news about the job situation is viewed negatively, the public is more upbeat about news about gas prices. Currently, as many say they are hearing mostly good news about gas prices as mostly bad news (31% each). In March, fully 85% said news about gas prices was mostly bad; just 2% said it was mostly good.